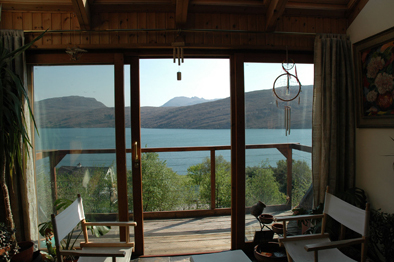 Set three miles north of Ullapool on a single-track road to the township of Rhue, this architect designed house was self-built according to strict standards of environmental design and energy efficiency. Views to the south look over Loch Broom to an Teallach; to the east Ben Dearg dominates the head of the loch and, in the west, the sun sets over the Summer Isles. Ullapool is an ideal base from which to explore the incomparable wilderness scenery of the North-West Highlands of Scotland, north along the coast road to Durness or south into the rugged mountains of Torridon, or for a night’s stop before travelling to the Outer Hebrides on the car ferry from Ullapool. We offer a 10% discount to clients staying four nights or more. Within reach are many interesting attractions: a museum in Ullapool, Knockan Crag Centre which explains the unique geology of the region, forest walks and gardens including the world-famous Inverewe Garden, an hour’s drive to the south at Poolewe. It is possible to engage in a number of activities in the area, including golf, sailing, walking, mountain climbing and rock climbing. The nearest crag is situated less than 500 yards from the house. Barry is a qualified mountain leader and can offer guiding, or advise on suitable routes to do. A new snorkeling route and guide has recently been developed for the area. 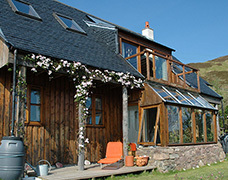 If all this seems too energetic, you can always relax in the sun room and look out for porpoises, otters and gannets. If you are very lucky you may spot one of the sea eagles which nested this year in Annat Bay. A variety of entertainments are on offer in Ullapool and the restaurants serve the best produce including locally caught sea food. This family home offers vegetarian breakfasts and has three guest bedrooms: a double with en suite, and a double and twin room sharing a bathroom, which is ideal for families.